Three Rooms Press, 9781941110256, 256pp. As cofounder of the internationally-known, highly-controversial radical political troupe, The Living Theater, author Judith Malina is one of the leading female countercultural figures of the 50s, 60s, 70s and beyond. 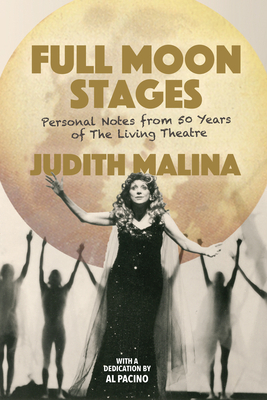 in FULL MOON STAGES: PERSONAL NOTES FROM 50 YEARS OF THE LIVING THEATRE, she creates an intimate memoir in a unique format with a collection of personal notes written on every full moon for 50 years from 1964 to 2014. These never-before-published entries reveal Malina's most private thoughts and inform the reader on what The Living Theatre was performing as they wound their way from New York City to Italy, France, Belgium, Germany and Brazil in a nomadic series of notable performances of such underground classics as The Brig, The Connection, and Paradise Now. Malina is relentless in her commitment to the full moon schedule, writing regardless of her current life circumstance. Notes issue forth from hotels, trains--even prison, offering a light on the consequences of holding true to her code of the theatrical expression of her pacifist-anarchist principles. The book's format is well-suited for modern readers interested in history of the counterculture. In addition, the book includes 30+ rare historical photos from Living Theatre archives. Judith Malina is a German-born American theater and film actress, writer, and director. She was one of the founders of The Living Theatre, a radical political theatre troupe that rose to prominence in New York City and Paris during the 1950s and 60s. She lives in New York City. She trained with Erwin Piscator at the New School for Social Research in New York, where the pioneering director established a "Dramatic Workshop, during his exile from Nazi Germany in the mid-1940's. In 1947 she and painter Julian Beck founded The Living Theatre as an artistic and socially-conscious alternative to the commercial theater. Since then she has directed (and often acted in) more than sixty important productions which have hadconsiderable influence on the development of contemporary theater, including William Carlos Williams' "Many Loves," Jack Gelber's "The Connection," Kenneth H. Brown s "The Brig," Bertolt Brecht's "Antigone" and the collective creations "Mysteries and Smaller Pieces," "Frankenstein," "Paradise Now" and "The Legacy of Cain." Judith Malina, along with The Living Theatre Company, has been arrested and imprisoned in various countries for the theatrical expression of the group's anarchist-pacifist principle. Following the untimely death of Julian Beck in 1984 she has directed the company alongside Hanon Reznikov, whom she married in 1988. Malina is also the author of numerous published essays on theater and politics, diaries, poems and plays and occasionally appears as an actress in films ("Dog Day Afternoon," "China Girl," "Awakenings," "Enemies: a Love Story," "The Addams Family," "Household Saints" and "When in Rome") and television ("Miami Vice," "Tribeca," "ER," "The Sopranos"). She has taught at Columbia University, New York University, the New School for Social Research and is a 1996 recipient of an Honorary Doctorate from Whittier College. In 1999, she and Hanon Reznikov opened the Centro Living Europa, the European headquarters of The Living Theatre in the Palazzo Spinola of Rocchetta Ligure, Italy. In 1975 Malina was given a lifetime achievement Obie award, she was a recipient of a 1985 Guggenheim award, in 2003 Malina was inducted into the Theatre Hall of Fame, and in 2008 she was awarded the Brazilian President's Medal for Outstanding Artistic Achievement. In 2007, The Living Theatre inaugurated a new, performance space on the Lower East Side of New York City. The theatre opened with an incredibly successful revival of "The Brig" directed by Malina, which was awarded Obies for Best Ensemble and Best Direction and is still touring in Europe."